1. ULT Cover made of heavy duty water-resistant polyester fabric. 2. 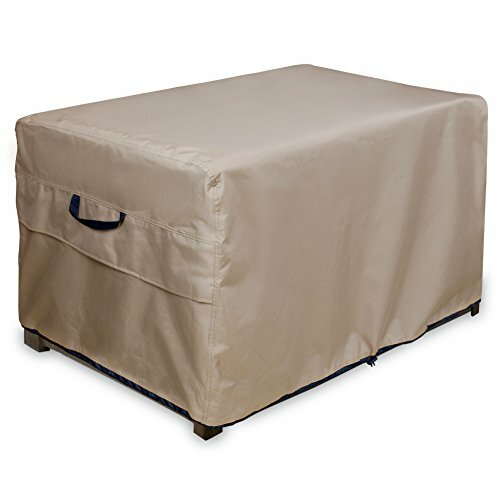 Outdoor furniture cover will protects your deck box from dirt, dust, rain, hail, bird droppings, UV rays etc. 3. Side air vent reduce inside condensation and wind lofting. 4. Reinforced Padded handles for easy fitting and removal. 5. Attachment Straps snap over legs to secure cover on the windiest days. 6. Elastic hem cord with toggles allows adjustment for a tight custom fit. We provides the best quality, long lasting furniture cover, our covers weights much heavier than other covers on the market. Make sure to measure your furniture before you choose cover size. For more high quality patio covers please visit ULT Covers Amazon Store. Made of top quality 600D polyester canvas complex with Eco-friendly vinyl backing. UV-resistant and tough enough to keep rain, hail, snow, dust, leaves and bird drops away. ULT Cover provides 5 years warranty and guarantees to be 100% waterproof with seams taped, it's a "WATERPROOF AND BREATHABLE" cover. Well-made structured air vents at two sides stay open to prevent wind lofting and mildew, snug fitting & heavy duty elastic draw cords keep the cover secured, especially during high winds and severe weather. Both sides have padded handles for removal easily. 100% coverage UV-resistant design avoids the exposure of furniture in the sun makes your furniture always look like new. If you have any questions about this product by ULT Cover, contact us by completing and submitting the form below. If you are looking for a specif part number, please include it with your message.